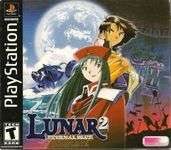 Developer: Game Arts Co. Ltd.
Lunar 2: Eternal Blue Complete is a remake of Lunar: Eternal Blue, originally released for the Sega CD platform. This game is part of the Lunar series. The story takes place approximately one thousand years after the events of Lunar: Silver Star Story Complete. Once again, Lunar (an inhabited moon that circles a planet called The Blue Star) is endangered, this time by the return of Zophar, the God of Evil responsible for the destruction of life on the Blue Star millennia before. This causes Lucia, a being assigned the task of eventually reviving life on the Blue Star, to awaken before her time and set forth on a mission to once again eliminate Zophar's influence. The story then unfolds from the perspective of Hiro, a teenaged archaeologist who resides in the Salyan Desert with his grandparent and adolescent dragon companion Ruby (who, like Nall in the previous game, resembles a talking, winged cat). The game begins with Hiro and Ruby pilfering a Dragon's Eye jewel from one of the several ancient ruins in their region. The escapade ends with Hiro inadvertently setting off a trap that forces them to flee from the ruins and ultimately prevents their return. On the way back to the research outpost, Hiro and Ruby are stopped by a principle member of Althena's Guards, the arrogant and boisterous White Knight Leo, who informs them that a 'Destroyer' is to appear at the ruins to the Northwest and that they should return to their homes immediately. Upon arriving at their home, the two find Leo attempting to extract information about the nearby ruins (referred to as 'The Blue Spire') from their grandfather Gwyn, an elderly archaeologist, in the hope of achieving access to the ruins' impenetrable interior. Finding Gwyn of little use, Leo departs, leaving the three of them to ponder the arrival of the so-called 'Destroyer'. When Hiro climbs to the roof to survey the status of their surroundings, he witnesses a mysterious light emanating from the Blue Spire. He informs his grandfather of the strange phenomenon, and the three of them decide to investigate the ruins for themselves. The differences between this title and Lunar: Eternal Blue on Sega CD are numerous. The Lunar 2 remake implements many of the same gameplay revisions as are found in Lunar: Silver Star Story Complete; there are no battles on the overworld and no random encounters. Also like Lunar: Silver Star Story Complete, the size of most of Lunar 2's many dungeons decreased substantially from the original game. Four dungeons were cut from the remake, and several new ones were added (the exact number varies from Saturn to PlayStation). The Magic Experience system from the original game does not appear in the remake. The graphics are more detailed than in the original release, due to the higher resolution and broader color palette of 32-bit platforms, compared with the Sega CD. While many monsters from the Sega CD version recur, they are all redrawn, and a number of bosses look quite different. The overall number of full-motion video (FMV) cutscenes in Lunar 2: Eternal Blue Complete is about 35, significantly reduced from the original MegaCD/SegaCD version's 61. A number of short, scene-setting cutscenes and minor character introductions were cut from the remake. Despite this, the total amount of FMV time is longer in the remake because many scenes were extended. Source: Wikipedia, "Lunar 2: Eternal Blue Complete", available under the CC-BY-SA License.